Can you have too much of a good spice? Nah! As a child, I have fond memories of watching my mother and grandmother in the kitchen making chicken soup. They’d dig around in the spice drawer and take out that special ingredient that always make the soup extra delicious. It was in these moments that I became fascinated by spice. In my mind, the right spice or herb was the magical ingredient that could make or break a dish. So…what’s this spice? Can it help me navigate? Imagine my delight when I discovered sumac. Before a year or two ago, I had no idea that this spice existed. Now I am fascinated with this lemony red spice. Sumac is primarily used in Middle Eastern cooking to add a bit of tartness to dish. It is also one of the essential ingredients in za’atar, a spice mix used again in Middle Eastern cuisine and delicious mixed with olive oil and spread on flat bread. 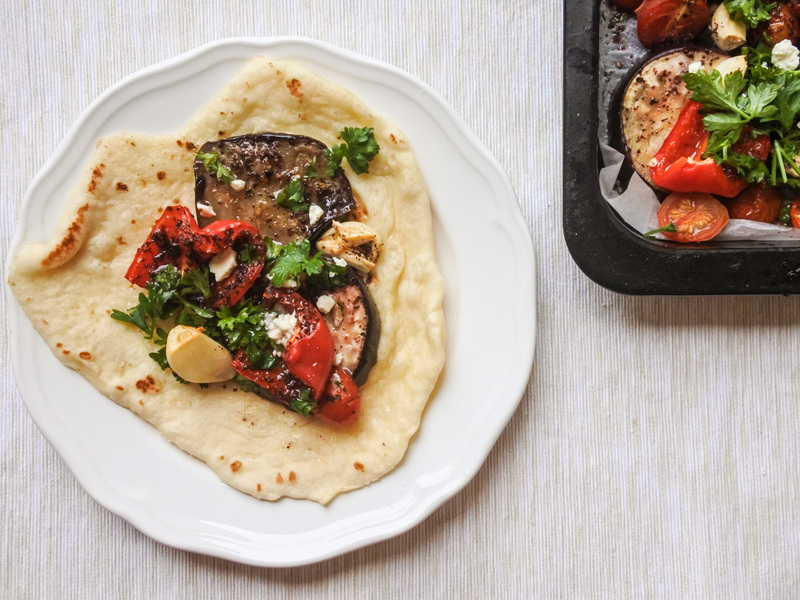 For this recipe, I sprinkle a bit of sumac on eggplant, red bell pepper, cherry tomatoes and garlic and roast it in the oven with olive oil. The end result is a delicious and healthy side dish that is great when paired with lamb or hummus. You could even add some chickpeas to the mix for a vegetarian sheet pan dinner. Pair it with tasty pita, naan or soft flat bread and you’ll soon fall in love with it just like I did. Wash and dry eggplant. Cut into 1 cm/0.5 in thick slices. Wash and dry cherry tomatoes. Cut into halves. Wash and dry red bell pepper. Remove the seeds and cut into eight equal pieces. Remove garlic cloves from their shell. Put vegetables on baking tray and evenly spread about. Sprinkle with sea salt, black pepper and za’atar. Place in the oven and roast for 45-60 minutes. Check on the vegetables half way through and if you find the eggplant is dry, lightly brush with water and continue cooking in the oven. When vegetables have finished cooking and are nicely carmelized from roasting, remove from oven. Drizzle with fresh lemon juice and sprinkle with feta. Eat as a side dish to lamb or go vegetarian and pair it with hummus wrapped up in a tortilla, pita or naan bread. Preheat oven to 450F/220C. Wash and dry eggplant. Cut into 1 cm/0.5 in thick slices. Put vegetables on baking tray and evenly spread about. Drizzle with olive oil. Sprinkle with sea salt, black pepper and za’atar. Place in the oven and roast for 45-60 minutes. Check on the vegetables half way through and if you find the eggplant is dry, lightly brush with water and continue cooking in the oven. When vegetables have finished cooking and are nicely carmelized from roasting, remove from oven. Drizzle with fresh lemon juice and sprinkle with feta. Eat as a side dish to lamb or go vegetarian and pair it with hummus wrapped up in a tortilla, pita or naan bread.